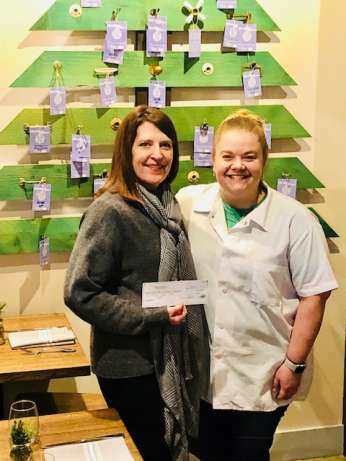 Chef/owner Breanna Beike and Co-owner Chris Brende of Heritage Restaurant I Bar in Woodinville and guests who visited their restaurant in December, generously raised 2K for the nearby foodbank, Woodinville Store House this past holiday season. The charity partnership, forged late last year offered Heritage guests the option of making a cash donation to the food bank when paying their tab at the restaurant. Last week, Chef Breanna and Woodinville Storehouse Volunteer Director, Julia Francis announced that an on-going relationship between Heritage Restaurant I Bar and the Woodinville Store House had been forged. Because Bre and Chris are passionate about food and giving back to the community in which they live and work, Chef Bre will be donating cases of fresh produce to the foodbank weekly. Bre will also be teach cooking classes for Store House clients in the food bank kitchen and taking part in other food bank events being sponsored throughout 2019. Heritage Restaurant I Bar is a locally owned, full service establishment, in the heart of the Woodinville Wine Country. Woodinville resident Chef/Owner Breanna Beike, who fashioned her restaurant as a community hub and casual meeting place, serves modern American food and drinks. A welcoming location, where residents gather often, tourists don’t feel like tourists and the offerings are approachable and modestly priced. Rustic wood, barn style doors, muted tones of vintage blue, gray and antique red set the scene in a space that is a mix of reclaimed and new. Heritage is family friendly, great for date-night and a wine tourist’s “not to be missed” location. The Woodinville Storehouse Food Bank is operated by a coalition of churches and denominations serving the local community of Woodinville, Bothell, Kirkland, Kenmore and Redmond, by providing nourishment and ministry to those in need. WSF is a faith-based non-profit that is unique in the quality of fresh food provided including dairy, baked goods, fresh produce and vegetables. Those in need are welcomed to spend time in comfort and prayer where healthy food and support are available every Tuesday and Saturday.